Early macular degeneration treatment is the focus of Dr. Robyn Guymer's research study at the Centre for Eye Research Australia (CERA) in Melbourne, Australia. Unlike other macular degeneration treatments that are used in more advanced stages of this retinal disease, this treatment approach aims at destroying the first signs of AMD. Unlike other lasers that burn and destroy tissue, this non-thermal laser is delivered in nano-seconds to eliminate the macular drusen. The Australian designed nanosecond laser was developed by Ellex Medical Lasers Ltd. Tiny pulses of energy are administered into the back of the eye to eliminate the macular drusen that leads to the development of age related macular degeneration. These yellowish deposits become more common as people age and often are present without any visual changes or symptoms of AMD being present. The Executive Director of the Australian company, Malcolm Plunkett, Executive Director of Ellex, states that their laser can treat areas of the eye that were once considered too delicate for treatment. “If you imagine that the energy emitted by the nanosecond laser is equivalent to the height of an average adult, then a standard photocoagulation laser, such as that used to treat diabetic retinopathy, would be four times the height of the Empire State building. We’re talking about a minuscule amount of energy here but the results so far have been very promising." The name of the current study is Laser Intervention in Early Age-Related Macular Degeneration Study (LEAD). The stated purpose is " ...to determine whether 2RT nanosecond laser therapy slows the progression to advanced age-related macular degeneration." Individuals with intermediate AMD in one eye were treated with a single session of nanosecond laser treatment. The double blind study meant that some of the participants did not get the laser treatment. The machine was on stand-by mode for those assigned to the placebo or sham portion of the study. Eye examinations were performed every six months, out to two years post-treatment and the results were compared to an untreated group with early AMD. 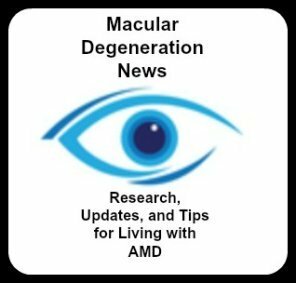 Three promising results have been reported from this macular degeneration study. “These findings suggest treating people with AMD with this new nanosecond laser reduces signs of the disease, ” says Erica Fletcher, associate professor of anatomy and neuroscience at the University of Melbourne. Published in the Journal of the Federation of American Societies for Experimental Biology, the study also shows evidence that nanosecond laser treatment in one eye can also produce positive effects in the other untreated eye. "It is hoped that this study will provide a basis for the clinical use of the low energy nanosecond laser in those with early stage age-related macular degeneration and that such a treatment will limit the progression of the disease to the advanced, sight-threatening forms," said Erica L. Fletcher, O.D., Ph.D., FAAO, a researcher involved in the work from the Department of Anatomy and Neuroscience at the University of Melbourne in Victoria, Australia.